Looking around for something to listen to, I randomly picked up a fairly new group: Slovakian symphonic power metal band Sinners Moon. For those who don't like Nightwish, you might as well pack up at this point, because it's obviously a huge influence on them. But considering all the Nightwish clones out there, it's kind of surprising that most of them aren't able to turn out songs quite as melodic as their influences, or provide vocals as good as Tarja (well, After Forever did -- but since their singer's fronting Nightwish now herself, I can't say that's typical). 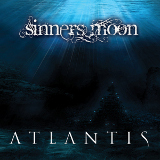 Sinners Moon is somewhat of an exception to this rule. They don't do a whole lot of things their influences haven't done before, but their songwriting is very good and their musicianship is top-notch. I must admit that I was a little nervous when I heard the quiet keyboard, heavily produced guitar, and vocalist Simona's high-pitched, opera-style vocals on Inner Demons -- too many bad experiences in the past --, but her voice sounds great, and best of all, it takes a definitive lead, instead of just singing three-note choruses and leaving everything else to a guy's death metal vocals. The band completely avoids bogging down in mid-tempo boredom by making sure all the songs are fairly quick-paced, with the production snappy and crisp, and they aren't kidding about the "symphonic" part. In addition to the usual orchestral keyboard sounds, on Buried there's a harpsichord passage that I liked a good deal, that melds cleanly into the guitar soloing. They finally bring in a ballad by the fourth track, Pray for the Child, with a elegaic melody that reminds me of a cross between Nightwish's Sleeping Sun and Hammerfall's Home of the Brave; here they still make sure to provide some heaviness, and that squeaky-clean production works even more in their favor than on the fast tracks. A similar melody on Falls of the Neverland, but with a harder-edged, more symphonic attack, sounds even better, and is one of my favorite tracks on here. They bring in Sonata Arctica's Tony Kakko to do the male vocals on My Servant, and while I wasn't as big a fan of the melody on this one, he does fit in decently on this one. The title track, however, felt like it was too long and complicated for what the band usually focuses on. Its polar opposite, Upon a Star, comes last. A little keyboard ditty with their previous singer, Andrea, putting her high, sweet vocals on display, it's the shortest song on the album, but differs from the rest of the more pop-oriented tracks (like the title track) without becoming boring and overly complicated for what it is. I was surprised to find myself liking Atlantis substantially more than I thought I would. Nightwish fans will almost certainly like it, but really anyone who's liked the pop-goth-tinged symphonic metal sound, even as a guilty pleasure, will probably consider this one pretty good.